About 11pm the other night I went out the back of my house with our two dogs. It was hard to miss this sight in the sky directly above me. A huge halo around the moon. I grabbed my camera gear and at 24mm I was just able to squeeze the whole shot in. (really wish I had the 16-35mm lens). After shooting it I did a bit of a search on google and I found out this is a fairly common affair and occurs when high thin cloud containing millions of tiny ice crystals cover much of the sky. Each crystal acts like a miniature lens. Because most of the crystals have a similar elongated hexagonal shape, light entering one crystal face and exiting through the opposing face refracts 22 degrees, which corresponds to the radius of the moon halo. The small white dot at the top of the halo is a star. This entry was posted in Uncategorized and tagged moon halo. Bookmark the permalink. When are we gonna have a beer ? Give us a buzz. That looks pretty damn cool! Yeah! 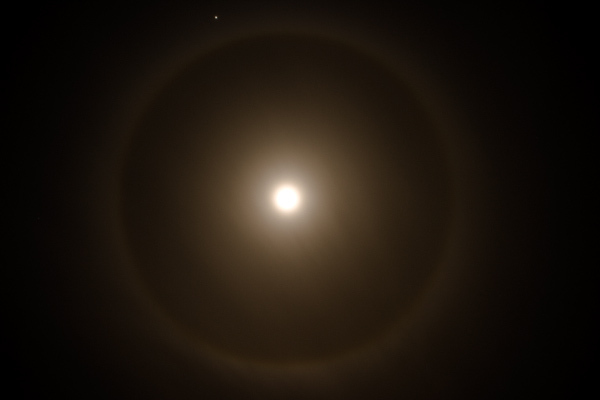 We just observed a moon halo tonight in Jacksonville, Fla. Beautiful!